Astronomy and paleontology have something in common: we both look at old things, and try to figure out how they came to be. In astronomy, sadly, we cannot hold the equivalent of an old bone in our hands. All we get is light from an object (barring the occasional meteorite). So we have to look very carefully to see what's what. Sometimes, we have to look outside the visible spectrum, too. Not only that, like any good detective we have to check the context -- the neighborhood -- too. 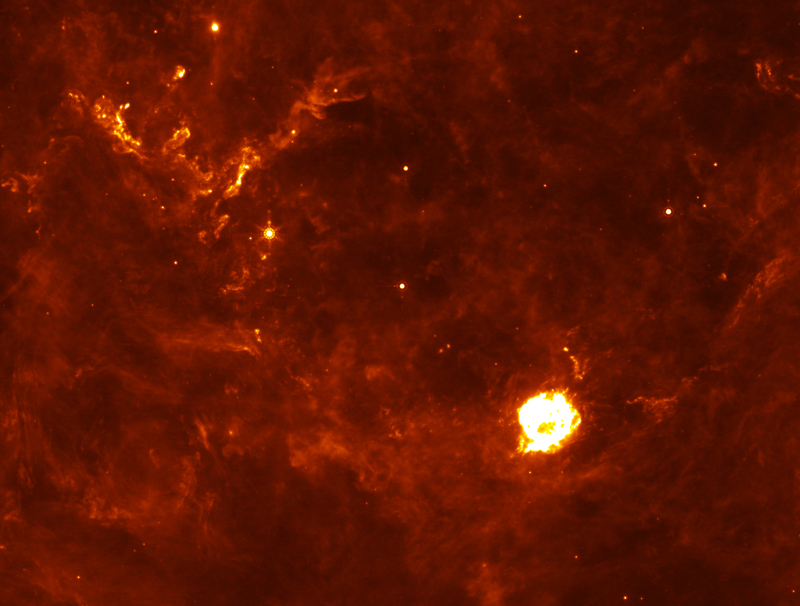 Spitzer infrared image of Cas A, now with blobby goodness. Cas A is a supernova remnant, the expanding cloud of debris from a star that blew up. In this case, the doomed star exploded in 1680. Even though it was close enough to be easily visible to the unaided eye (it should have been bright enough, barely, to see during the day!) no one noticed it. That's because between us and the star is a thick layer of interstellar dust. This floating junk absorbs light, so the supernova was dimmed to invisibility. That might sound like a disadvantage, but in this case, it worked out pretty well. That is, it worked out for us 300 years later. That dust has provided an important clue to the explosion itself. The picture above is from NASA's Spitzer Space Telescope, which snaps infrared portraits of the sky. The glowy thing at the bottom right is Cas A, the supernova remnant. The pretty cirrus stuff littering the image is dust: sheets, ribbons, and layers of it. You can see why Cas A wasn't visible when it blew up! All that junk blocked our view. But if you click the picture and see it properly embiggened, you'll notice some bright blobs helpfully circled to make it easy to spot them. By looking at the region in multiple wavelengths (different "colors" of infrared light), the temperature of the dust can be determined (dust is brighter at different wavelengths depending on the temperature). Those circled blobs are much warmer than their surroundings: they range from -120 to -170 Celsius (trust me, that's warm for dust). What gives? Those blobs were heated by the supernova blast itself. Even though the supernova was about 160 light years from those blobs, it still was able to warm them up. That's amazing! But this next part is totally cool. Literally. Blobs of dust should cool pretty quickly. So why do we see them, 320 years after the supernova? It's because we're seeing light echoes. Picture this: the blobs are on the other side of the supernova from our point of view. When the star blew up, the ultraviolet and X-ray flash from the event expanded outward in a sphere. 160 years later, it touched those blobs, heating them up. They in turn started emitting infrared light, and that light took another 160 years to get back to the supernova. So, light emitted by the supernova 320 years after the explosion would start its journey toward Earth just as the first infrared light from the blobs caught up to the supernova. What we see on Earth is the blobs lighting up 320 years after the light form the supernova reached us. So while, to us, the supernova is three centuries old, we see the blobs just lighting up now! There's our fossil that we can examine. It's like having a time machine, allowing us to probe the supernova at different stages of its life all at once. I know that's a bit confusing, but you've seen this effect many times. If you see a basketball player bouncing a ball from a distance, you hear the ball smack the pavement a fraction of second after you see it. But now put a wall behind the player. The sound hits that wall and reflects -- echoes -- back to you, delayed because that sound has to travel from the ball to the wall, then back again that distance. If it takes the sound one second to reach the wall, say, then you hear the sound delayed by two seconds. It has to make a round trip. Same thing with Cas A. The light left the supernova, hit the blobs, then came back, adding 300+ years to the travel time. So we see them now as if the light were just hitting them! We're catching an echo of the original explosion, revealed as if it were fresh once again. And by measuring the dust's properties, it can be determined that they were indeed irradiated by a flood of ultraviolet and X-ray photons, created when an immense shock wave broke through the surface of the exploding star. This "UV breakout" from the shock wave was well known to exist, but it has only been seen directly recently. This new observation gives us indirect evidence of it too. That's fine by me, evidence is evidence, and catching the moment a supernova is born is incredibly rare. Those little blobs have opened a new door on studying supernovae, and, as a bonus, it's on a pretty famous one. Cas A is very well-studied, which means we have lots of other pieces of the puzzle to looks at. That makes it all fit better, and that's part of what science is about.